Another new visitor at the Animal Inn has the residents in a tailspin in this second zany novel in a brand-new chapter book series where the fur—and fun—flies at an animal spa and hotel. The Inn is run by the Tyler family along with their pets Leopold, the Macaw; Fuzzy and Furry, the gerbils; dogs Dash and Coco; felines Shadow and Whiskers. 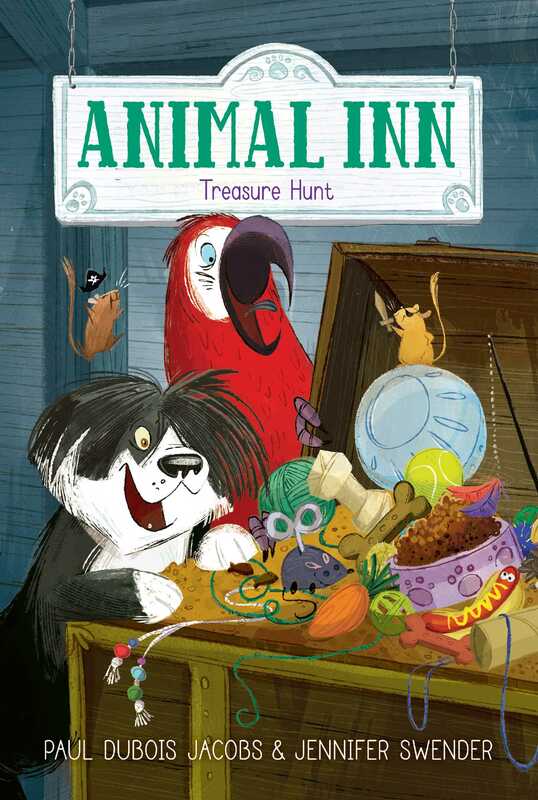 The Tyler animals are convinced a pirate with a glittering treasure is visiting the Animal Inn. Will the animals have to walk the plank in order to survive? Arghhh! The day began like any other Saturday morning. When I padded downstairs, the sun was just coming up. Mom was already in the Welcome Area with a cup of coffee in one hand and a to-do list in the other. Leopold was on his perch, his feathers neatly groomed. Leopold always likes to look his best. Dad soon came downstairs with an armload of camping equipment. “Did you find the poles?” Mom asked him. I looked at Leopold. Leopold looked at me. Saturdays at Animal Inn are rarely quiet. In fact, Saturday is our busiest day. Mom teaches her Polite Puppies class. Dad and Jake host the Furry Pages. That’s when children read aloud to an animal buddy. Then there are grooming appointments and usually a birthday party or two.